Okay, by now we all know sunburns are bad for us… but did you ever consider the effects of sunburns? Accordingly, what we think of as sunburns and tans are our skin responding to DNA damage caused by the sun’s ultraviolet light. Neither tans nor sunburns are intrinsically harmful, but they are both signs that your DNA has already been damaged – increasing your long term risk of skin cancer. When your unprotected skin is exposed to the sun, it soaks up ultraviolet A and ultraviolet B rays. Ultraviolet B rays are what are primarily responsible for sunburn – both mild and severe/blistering – while ultraviolet A rays are responsible for long-term effects, such as premature aging, sun spots and skin cancer. Even turning slightly pink is a sign of injury to your skin, says David McDaniel, M.D., FAAD, director of the Institute of Anti-Aging Research and co-director of the Hampton University Skin Of Color Research Institute. Accordingly, it is an indicator that you’ve reached the “minimal erythemal dose” (MED) –the lowest dose of sun exposure needed to produce a sunburn. The MED differs from person to person. It is stated that the time it takes for a person to develop a sunburn, as well as the severity of the sunburn, depends on several factors, such as the UV index (which could be influenced by cloud cover) and altitude. People in higher climates, for instance, face risk of a worse burn because they are actually closer to the sun. Furthermore, skin types’ susceptibility to sun damage, as well as how long a person with that skin type is exposed to the sun, are also big factors in sunburn. 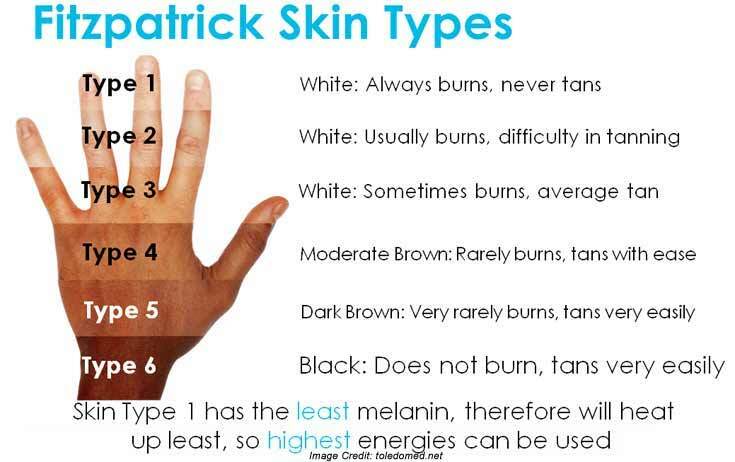 Dermatologists are said to generally use a skin classification system called the Fitzpatrick Skin Type to determine who is at highest risk for burns and skin cancer. There are six types, ranging from fair to dark. Type 2 – Very sun sensitive, burns easily, tans minimally. Example: Fair skinned, fair haired caucasians. Type 6 – Sun insensitive, never burns, deeply pigmented Example: Darker blacks. You may also like to read – Why Our Skins Darken When Exposed to the Sun? So – How do we get sunburns? Actually, a burn is your body’s defensive reaction to ultraviolet radiation. It’s said to be the same thing with a tan, but you turn red when the initial defenses on the frontline can’t protect you any longer. Accordingly – you’re more likely to get a sunburn when you’re getting direct sunlight: if you’re closer to the equator, at a very high altitude or during the summer when the earth’s tilt directly faces the sun. When the burn is really bad, your body forms blisters filled with liquid as an extra protective layer. So, when the skin peels, it’s actually a good thing. When UV radiated cells stay on your skin for too long, they are at risk for mutation. According to a report in Live Science – Gary Chuang, an assistant professor of dermatology at Tufts University School of Medicine explained that the peeling process is simply dead skin cells that have reached their expiration date. Remember Dr. Schultz – he recommends NOT tearing off a sunburn related blister, as it will increase infection risk. Instead, he recommends cleaning your hands and a needle with alcohol, and then using only a slight amount of pressure to push the needle through the blister. Then, gently push on the blister to get the serum out, before covering the blister with antibiotic ointment and a bandage. 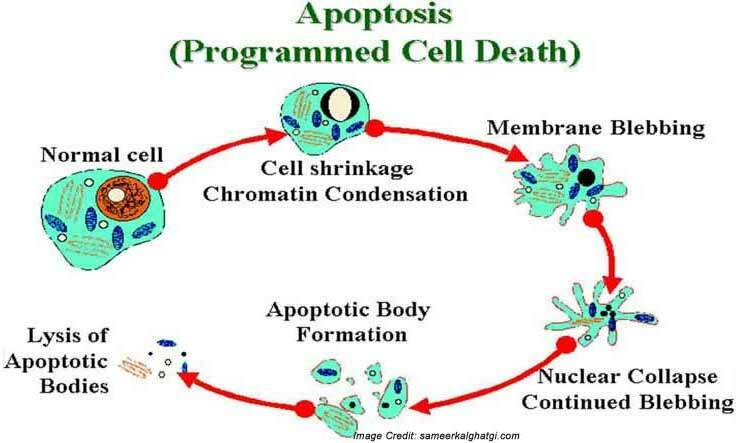 There is a process called apoptosis – this is classified as the death of cells that occurs as a normal and controlled part of an organism’s growth or development. However, this is also the body’s short term response to DNA damage – before melanin can take effect – to intentionally kill off the cells that have been damaged. This reduces the chance that mutated cells will begin uncontrollably reproducing, forming a tumor. Melanin is a dark brown to black pigment occurring in the hair, skin and iris of the eye in people and animals. It is responsible for tanning of skin exposed to sunlight. Read Also: How Melanin Production in Skin is related to Skin Color? So now – dead cells on the outermost layers of your skin can simply flake off sooner than they normally do – which you experience as peeling in the days after sunburn. But the thing is, there are deeper layers of your skin and these dead cells need to be actively cleared out as well. To trigger this, they release tiny fragments of damaged genetic material when they die, which signals to neighboring cells to initiate a series of changes known as the inflammatory response. The inflammatory response is defined as – occurring when tissues are injured by bacteria, trauma, toxins, heat or any other cause. The damaged cells release chemicals including histamine, bradykinin and prostaglandins. These chemicals cause blood vessels to leak fluid into the tissues, causing swelling. Accordingly, this is the same response your body makes to an infection. Your blood vessels dilate, to allow for increased blood flow – this will cause your skin to feel hot – and overproduction of particular proteins leads to pain and itchiness. Furthermore, if extremely high numbers of cells are killed, blisters can form, in order for blood plasma to pool next to the damaged tissue and aid in healing. It’s probably a good idea to try to prevent burning. The most basic advice is blatantly obvious – wear sunscreen, especially paying attention to high UV days and other effects such as your climate and elevation. This not only prevents sunburn, but also many types of skin cancer. Most dermatologists recommend sunscreens despite arguments related to evidence that some of the common active chemicals [in sunscreen] can cause toxic side effects, which is why some people recommend opaque mineral sunblocks. Dermatologists say that both short term (preventing sunburn) and long term (preventing cancer) outweigh the potential toxicity. They recommend using a sunscreen that’s labeled as broad spectrum (meaning that it protects against UV-A and UV-B radiation [rays]) and has an SPF over 30. Step One – get out of the sun. To relieve the pain, try a cool shower or bath, apply moisturizing or anti-itch cream and take an over the counter pain medication such as Advil or Tylenol. There is no scientific evidence that aloe vera gels help relieve the symptoms, but we all know they do. Drink lots of water – you will likely be dehydrated. Accordingly, if the sunburn gives way to sun poisoning – the name used for extreme cases of sunburn that involve headache, nausea, dizziness, swelling, and lots of blistering – it may be time to see a doctor. Otherwise, take note that your burn will start to heal within a few days and most likely will be better (healed) on the surface, within a few weeks. The invisible DNA damage, though, is cumulative – the more times you tan or are burned throughout your life, the greater the long term risk of skin cancer. According to WebMD, skin cancer is often or usually caused by years of too much sun exposure. More than 90% of all skin cancers are found on parts of the body that get the most sun most of the time. It is stated that the face, neck, ears, hands, and arms are common body parts that get skin cancer. Asymmetry – one half does not match the other. Border Irregularity – The edges are ragged, notched or blurred. Color – The pigmentation is not uniform. Shades of tan, brown and black are present. Dashes of red, white and blue add to the mottled appearance. Changes in color distribution, especially the spread of color from the edge of a mole into the surrounding skin, also are an early sign of melanoma. Diameter – The mole or skin growth is larger than 6 mm or about the size of a pencil eraser. Any growth of a mole should be of concern. Evolution – There is a change in the size, shape, symptoms (such as itching or tenderness), surface (especially bleeding), or color of a mole. Yes, the sun feels nice on our skin and a tan always looks nice… but please don’t burn – wear sunscreen and be wary of your health from this standpoint. You May Also Like: Difference between Sunscreen and Suntan Lotion.